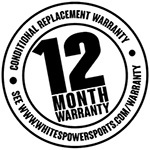 WHITES POWERSPORTS BRANDED PRODUCTS WARRANTY POLICY. 1. Whites Powersports (Whites) conditionally warrants its branded products to be free from defects in material and workmanship for 1 year from date of original retail purchase. 2. Such conditions vary between product groups. 3. Whites will repair or replace (at their option) free of charge an item determined by them as a faulty under a valid claim. 4. The final validity of any claim shall be made by Whites, and does not extend or include liability for any incidental or consequential damages. Cost of removal, reinstallation, product pickup, and delivery are the sole responsibility of the purchaser. 5. Damaged, modified, improperly used or maintained products, and products used for any form of racing are expressly excluded from this warranty. 6. Whites warranty is in addition to consumers legal rights. · Apply to the original retail purchaser only. · Be considered when the product claimed is received at the point of retail purchase, accompanied with a copy of purchase receipt dated within 12 months, and any supporting evidence reasonably requested by Whites. Must be properly installed by a suitably qualified person and correctly used and maintained. If the unit has been disassembled or modified in any way, or damage is due to torn or perforated CV boots, warranty shall be considered null and void.